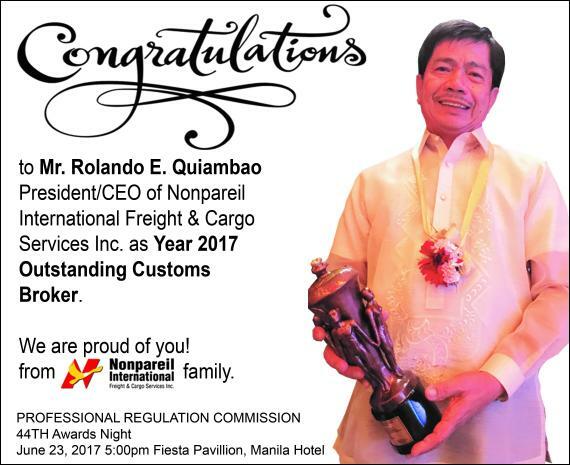 Members in the Philippines, Nonpareil International Freight & Cargo are pleased to announce their President & CEO, Mr Rolando E. Quiambao has been awarded Most Outstanding Customs Broker 2017 at the 44th Awards Night of the Professional Regulation Commission (PRC) in the Philippines. The event was held last month in Manila. "The PRC serves more than 3.9 million professionals from 43 various regulated professions and hundreds of thousands of aspiring professionals take the nomination examinations every year. The PRC stakeholders include Philippine professionals, would-be professionals, accredited professional organisations, foreign professionals seeking temporary permits to practice in the Philippines, schools, academies and government agencies. The PRC affects the lives of every Filipino relying on the services of professionals." Congratulations from the PCN Head Office to Rolando and the Nonpareil team on this recognition of their excellent services!